Every week until Election Day 2016, Showtime will air a half-hour "real-time documentary" about what's happening on the campaign trail. The series, called "The Circus: Inside the Greatest Political Show on Earth," comes from Mark Halperin and John Heilemann, the hosts of a daily political talk show on Bloomberg TV, and Mark McKinnon, a famed campaign strategist. Showtime announced the new show on Tuesday, hours before the final Republican primary debate of 2015. It will premiere in January. "This will be a real time vérité documentary that shows the behind the scenes of how the campaigns and the candidates actually operate. Nobody else is doing this kind of coverage," Showtime Networks president David Nevins told CNNMoney. Showtime said the show will be "produced in cooperation with Bloomberg Politics." 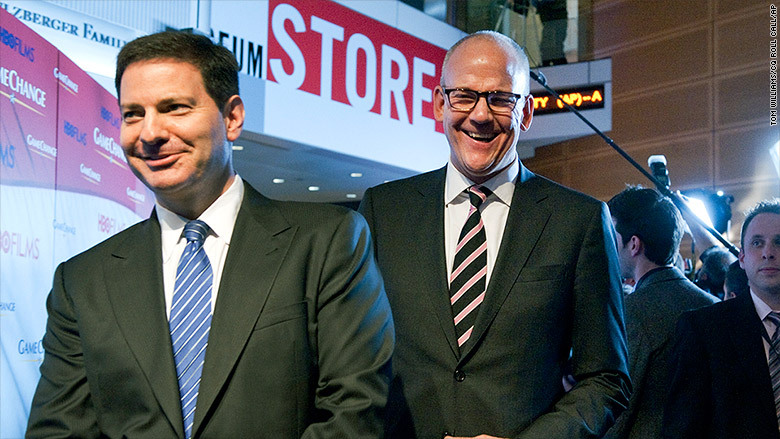 Halperin and Heilemann, who co-authored the best-selling "Game Change" books after the 2008 and 2012 elections, host "With All Due Respect" on Bloomberg TV. That show will soon start to replay on MSNBC one hour later. But "The Circus" is something different. It will rely partly on behind-the-scenes access to campaigns and events. "What we capture on the show will be proprietary to 'The Circus,'" Nevins said. "If and when they uncover breaking news, we may choose to show bits on their Bloomberg show or another outlet, but the meat will be on the weekly Showtime show." The series is part of Showtime's effort to add more unscripted programming to its slate. The network recently hired Vinnie Malhotra, one of the executives who led CNN's expansion into documentaries and films. Showtime was traditionally only available through cable and satellite systems, but people can now also subscribe through streaming video sites like Hulu and Amazon Prime. A timely series like "The Circus" -- one that could be binged, but is best viewed as soon as it comes out -- could have particular appeal to new subscribers. Nevins has high hopes for the series. "I loved 'The War Room' and the Romney documentary," he said referring to "Mitt," which Netflix premiered in 2014. "But it's no longer necessary to wait until year after the election to get an all-access documentary." Halperin and Nevins have a long history. They have known each other since high school. He, Heilemann and McKinnon brought the show idea to Showtime. As it so happened, Nevins has been "very interested in trying to use new documentary technology -- small cameras, very fast post production -- for a subject beyond the world of sports," he said. "Politics was an obvious choice." Production is already underway: McKinnon was spotted with a camera crew at a Marco Rubio rally in Las Vegas on Monday.